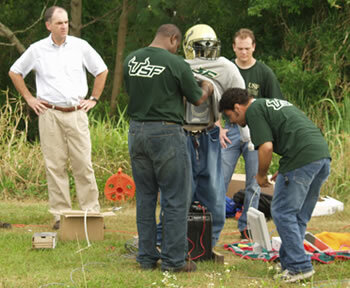 Technical wizards at the University of South Florida at Tampa have designed a scarecrow robot to help keep predatory birds away from fish ponds. The robot consists of an Internet-enabled video camera and image processing software that scans for color and shape - searching for the signs of predatory birds. Fish farming is a $42 million industry in Florida; farmers have tried tethered balloons, propane cannon and motion-sensitive sprinklers (among many others) to deter unwanted bird pests. When birds are detected, powerful jets of water and loud sound barrages are released. One limit noted is that the stationary scarecrow cannot police a very large area. For something more mobile, researchers might consider the scarebots created by LSU researchers several years ago. Assistant professors Steve Hall and Randy Price of the LSU Department of Biological & Agricultural Engineering designed an autonomous solar-powered robot that could run unattended for long periods of time. The Scarebot would patrol fish ponts, scaring away the predatory birds. Science fiction has a long and honorable agricultural robot history; I just recently added an article about the agricultural robot pest controller from the excellent 1985 Michael Crichton movie Runaway. Also, read more ab out AgBots and Robotic tomato harvester for real-world agrobots. Find the source article on scarecrow robot here.